James Randi, the famous paranormal hunter raised a question about the healing happening with Lee-Jaerock. On a completely different matter, here's a link to a picture of a man "healed" by a faith healer in St. Petersburg. 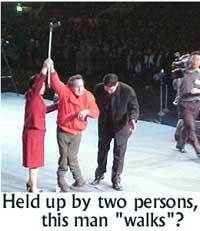 The man holds his crutch aloft: the fact that his leg is clearly still withered and that he is being supported by two other people seems not to concern the author of the piece at all. Richard directs us to http://www.assistnews.net/Stories/s03110045.htm for details. Dr. Lee Jae-Rock, senior pastor of the 80,000-member Manmin Joong-Ang Church in Seoul, South Korea, is the leader of this weird group. It's typical of those evangelical agencies that never follow up on their "healings," but are believed and supported by their followers.